My freezer is starting to overflow with leftover ingredients, so it’s time to take stock of what I have and find recipes to use it up! 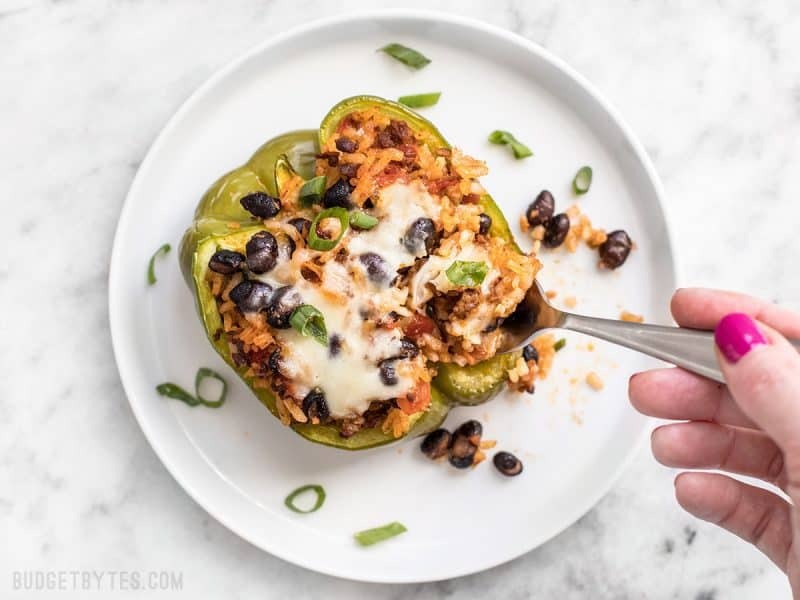 I had a half pound chorizo left over from my Chorizo Sweet Potato Skillet, so I decided to do some quick and easy Chorizo Stuffed Bell Peppers. 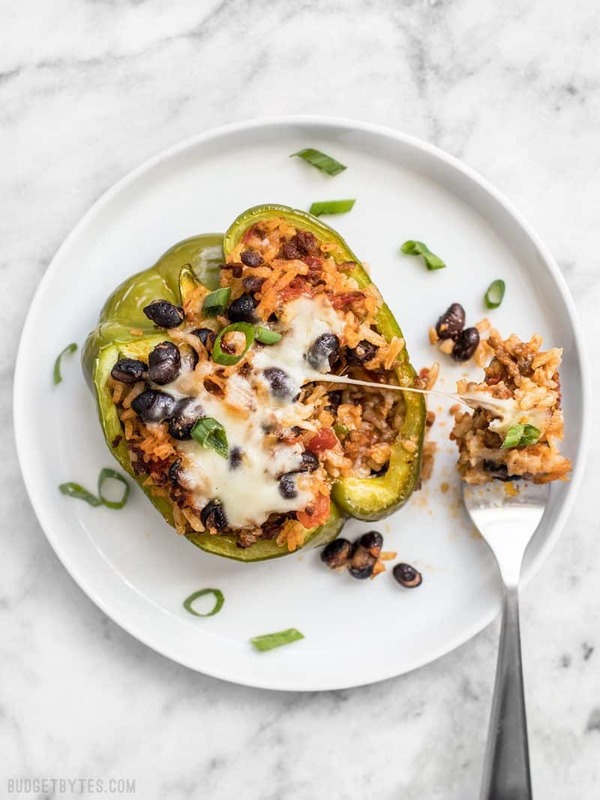 This is a super simple, scaled back stuffed pepper that is still totally flavorful and manageable for a weeknight. If you want to go one step further, or if you like things extra saucy, you can whip up a batch of my Easy Red Enchilada Sauce to drizzle over top of the peppers. The magic of the simplicity of this recipe is all in the chorizo. Chorizo has so many herbs and spices built in that it tends to flavor whatever dish you’re using it in, without needing to add much else. If you want to go vegetarian with this one, I suggest either using a soyrizo product, or adding something like taco seasoning to make up for all the flavor the chorizo brings to the table. Also note, this recipe calls for Mexican chorizo, which is a fresh meat product. Spanish chorizo is a cured meat product, similar to salami or pepperoni, and will not give the same results. You will need pre-cooked rice for this dish, but that makes it a great way to use up leftover rice from the night before. 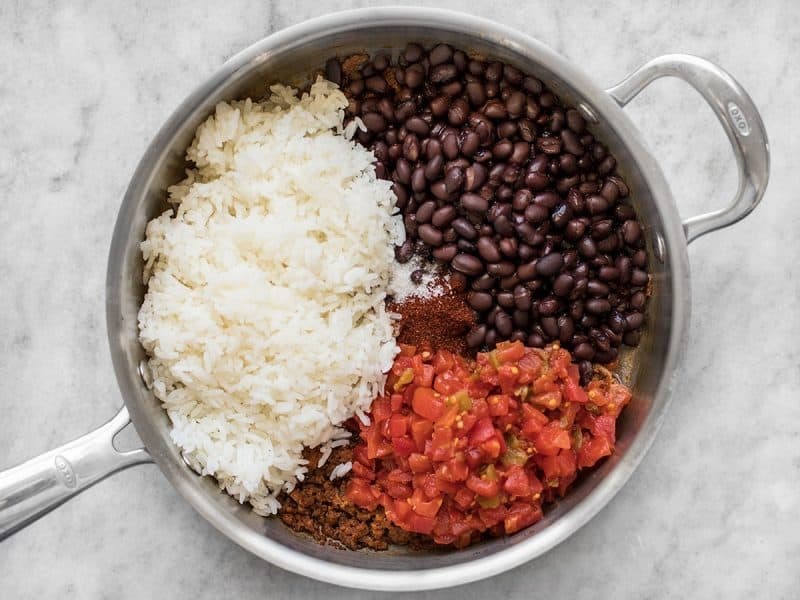 If you don’t have any pre-cooked rice on hand, you can just get a pot going before you begin cooking the chorizo and it should be done in no time. P.S. If you can’t find diced tomatoes with green chiles, you can use something like fire roasted diced tomatoes, or regular diced tomatoes, and add a 4 oz. can of diced green chiles if those are available. 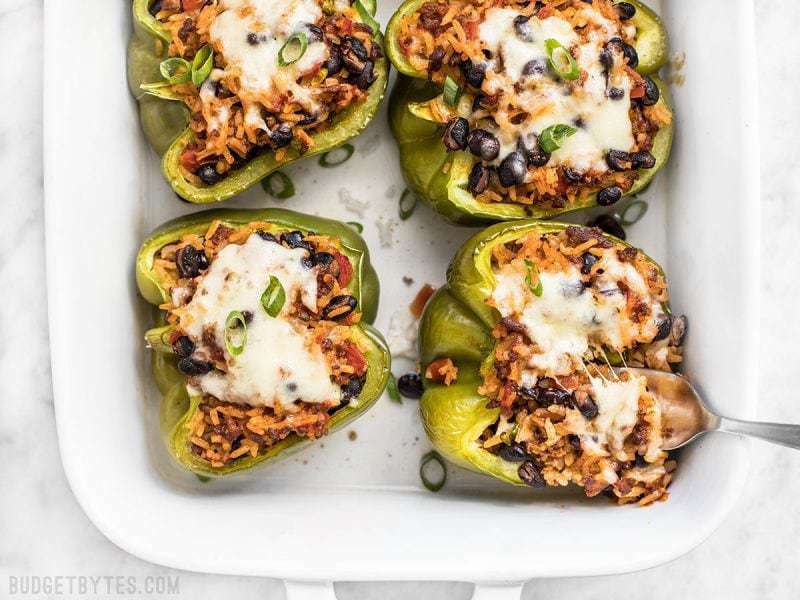 Super flavorful chorizo is the key to keeping these Chorizo Stuffed Bell Peppers simple and delicious enough for a weeknight dinner. Preheat the oven to 350ºF. Add the chorizo to a skillet and sauté over medium heat until fully cooked. Remove it from the heat. 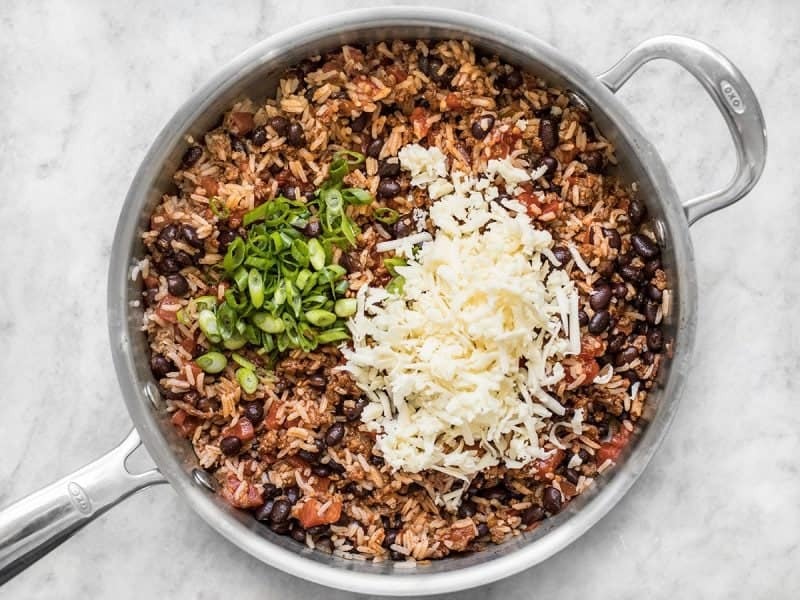 Rinse and drain the black beans, then add them to the skillet, along with the diced tomatoes (with juices), cooked rice, chili powder, and salt. Stir to combine. Add half of the cheese and half of the green onion to the chorizo mixture, then stir to combine. 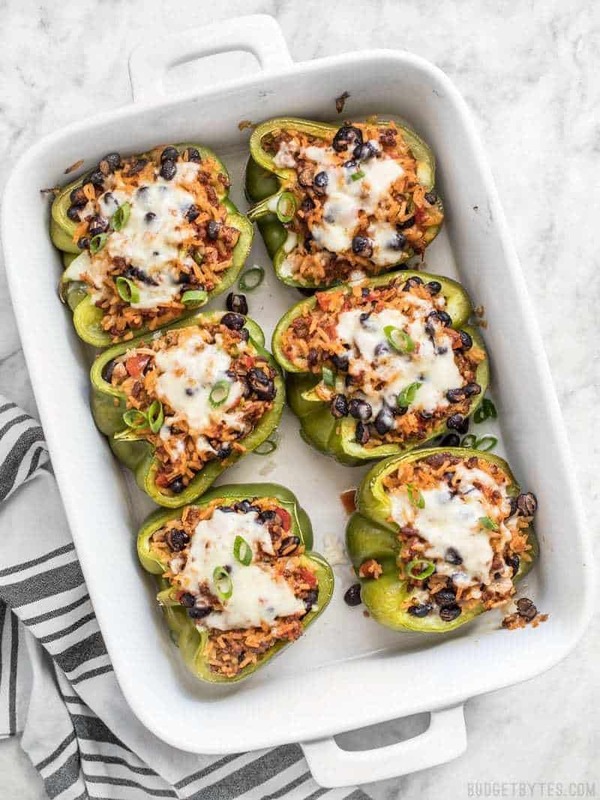 Slice each of the bell peppers in half and then carefully remove the white ribs and seed pods, keeping the stem intact to help hold in the stuffing. Pile the chorizo and rice mixture into each pepper, making sure to stuff it up into all the crevices, and mound it up over top. Place the peppers in a casserole dish as you fill them. Once all the peppers are filled, add about 1/2 inch of water to the dish to help the peppers steam and soften. Cover the dish tightly with foil, then bake for 30 minutes. 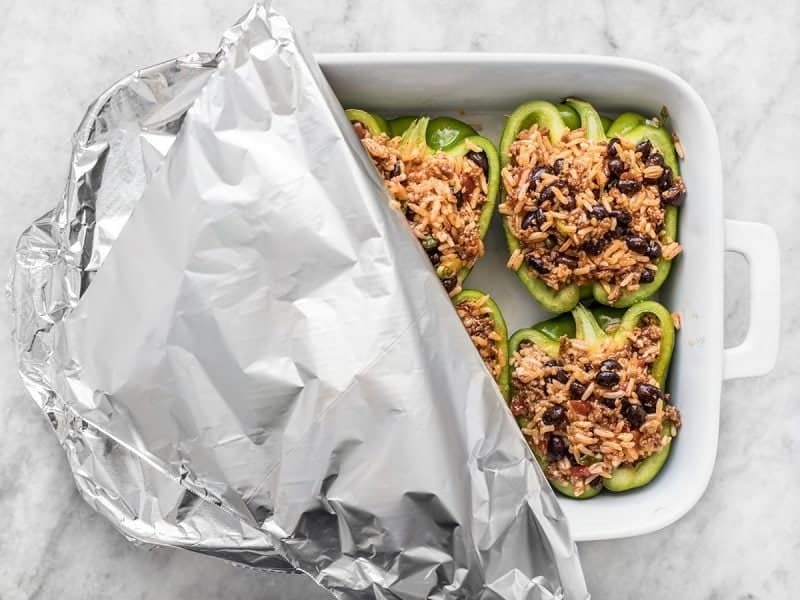 After 30 minutes, remove the foil and top the peppers with the remaining shredded cheese. Bake for another 10 minutes, or until the cheese is melted and bubbly on the edges. Top the peppers with the remaining sliced green onion just before serving. *Mexican chorizo is a fresh meat product and should not be confused for Spanish chorizo, which is cured, like salami or pepperoni. Begin by preheating the oven to 350ºF. Add 1/2 lb. 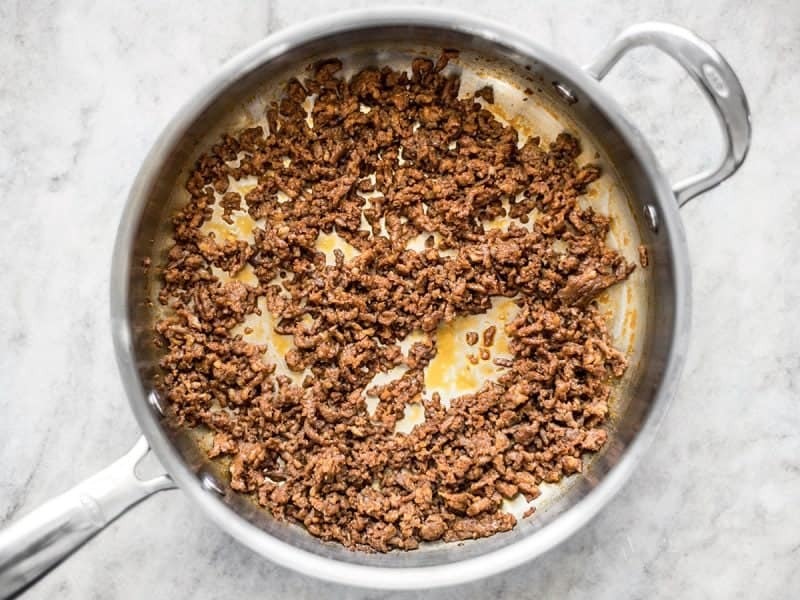 Mexican chorizo to a skillet and sautéing until it is fully cooked (about 5-7 minutes). I used Johnsonville chorizo, which is my favorite. It it not quite as fatty as some other brands I’ve used, but still enough fat to be quite flavorful and not to need any extra oil in the skillet as I cook it. Turn the heat under the chorizo off and add 2 cups cooked rice, one 15 oz. can black beans (rinsed and drained), and a 10 oz. can of diced tomatoes with chiles (like Rotel), 1/2 Tbsp chili powder, and 1/4 tsp salt. Stir until everything is combined. After everything is mixed together, it won’t be quite so hot, so you can stir in 2 oz. shredded cheese and half of the sliced green onions. You’ll save the other 2 oz. cheese and the rest of the green onions to top the stuffed peppers. 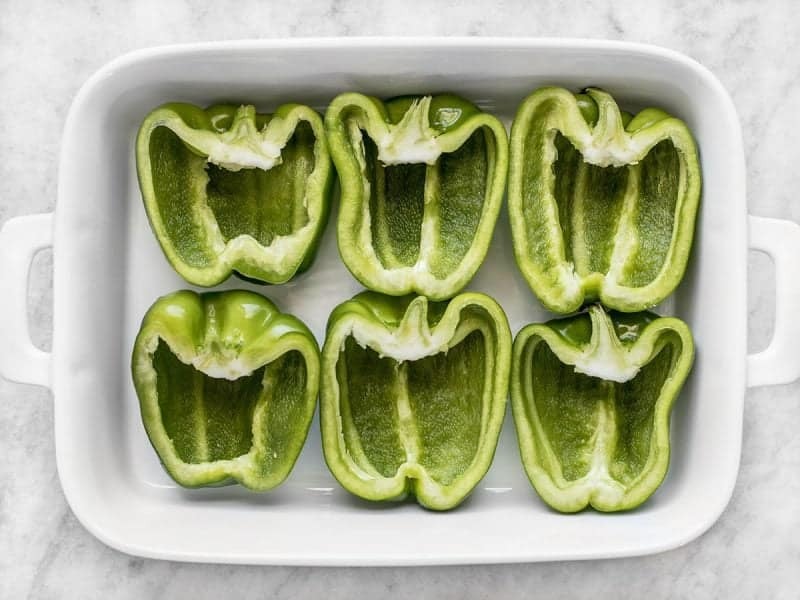 Slice three large bell peppers in half, lengthwise, then carefully remove the white ribs and seed pods, while leaving the stems intact. I left the stems on so the peppers would be a closed container without a hole on the side for the stuffing to fall out of. You can simply eat around the stem. 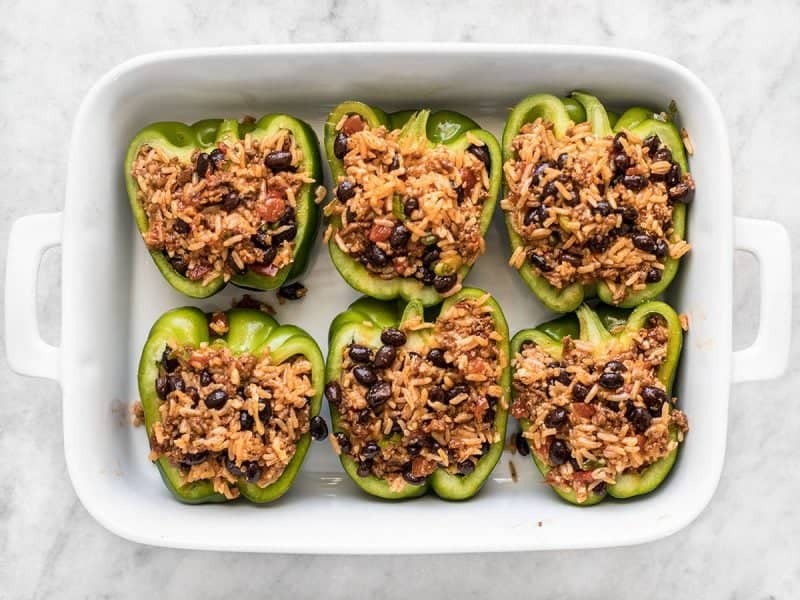 Stuff the bell peppers with the chorizo and rice filling, making sure to get it up in all the nooks and crevices. Mound it high on top because you’ll have a lot of filling. Place the peppers in a casserole dish as you stuff them, then add about 1/2 inch of water to the bottom of the dish. This will create steam and help the peppers cook. Cover the dish tightly with foil to hold in the steam, then bake for 30 minutes in the preheated 350ºF oven. After baking for 30 minutes, remove the foil and top with the remaining cheese. Bake for another 10 minutes, or until the cheese is melted and bubbly around the edges. 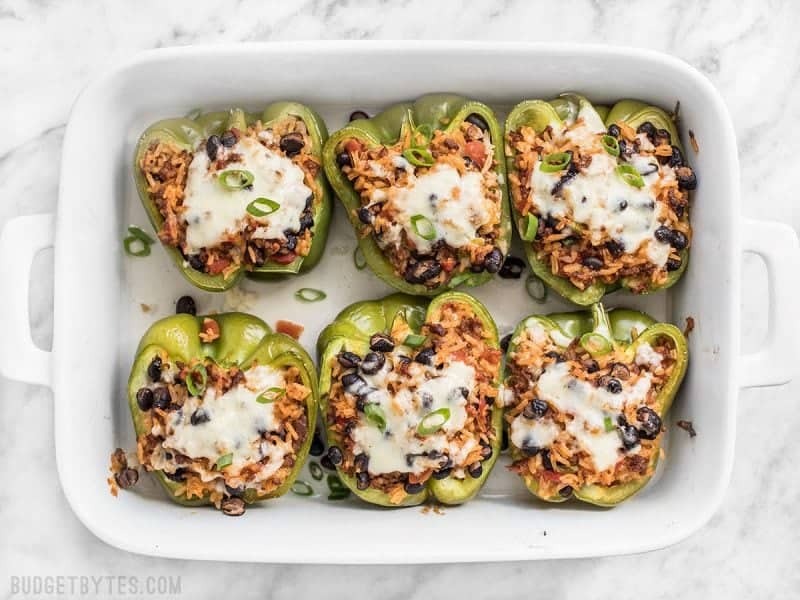 Take the chorizo stuffed bell peppers out of the oven and top with the remaining sliced green onion. Enjoy the cheesy chorizo-y goodness!! Can this be made with rice and beans instead of chorizo? Sure, I think that would be a delicious filling. You may need to add quite a few extra spices to make up for all the seasoning that is in chorizo, though. Another winner! Served with some sweet potato fries tossed with cumin and lime juice (because I was too lazy to chop up my own sweet potatoes). The peppers were a little al dente for my taste, so next time I might put them in the oven as it heats up as someone else mentioned. But the flavors were great! Also, I noticed that in the step-by-step section with photos, you forgot to mention adding the chili powder and salt. They’re in the photo but not in the caption underneath. I made these a few weeks ago and they were amazing! And the leftovers were fantastic. Thanks so much!